A beautiful, new, exclusive villa offering a relaxing al fresco lounge area overlooking the private swimming pool. 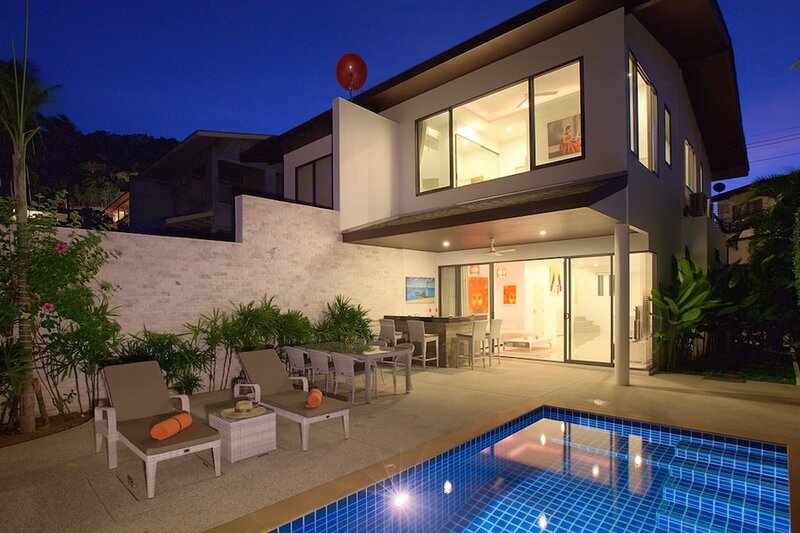 This residence is absolutely exceptional with all modern amenities. This stunning two-storey, modern contemporary villa with three bedrooms, two and a half bathrooms, (sleeps six maximum), private swimming pool and outdoor living area, is Ideal for families and friends to make memories last a lifetime. The perfect location to savour any season, ideally nestled above Choeng Mon beach, a charming area filled with a mixture of Thai and Western bars and restaurants. 10 minutes by car to Fisherman’s Village, and 10 minutes away from Chaweng, this villa is wonderfully located where you can enjoy the peacefulness away from the crowds. 3 Bedrooms, sleeps 6 comfortably. Each bedroom is completed with contemporary matching furniture and built-in wardrobes. All linen and towels are supplied. 1 King-size Bed, ceiling fan, air conditioning and shared en-suite bathroom with rain shower. 1 King-size Bed, ceiling fan and air conditioning and shared en-suite bathroom with rain shower. Electricity is not included in the rate and is charged at the local government unit of 6 THB per unit.